Do you take supplements daily to improve your overall health? You’re better off getting your nutrients from food, according to a new report. Researchers from Tufts University recently conducted a study, published in Annals of Internal Medicine, to explore the relationship between dietary supplement use and lower risk of death and disease. To do so, they examined more than 27,000 adults, age 20 and older, who used dietary supplements. 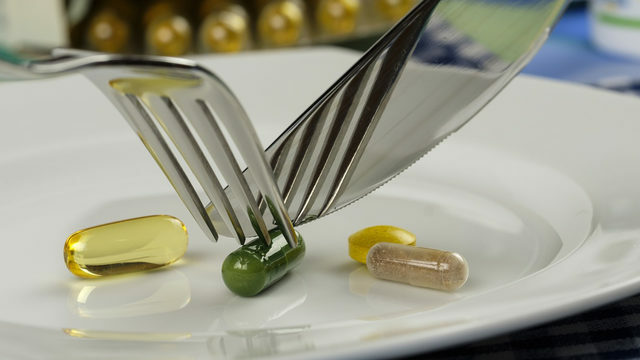 They recorded the supplement type, dosage and frequency use, then assessed whether adequate or excess nutrient intake was associated with reduced disease and death risk. After analyzing the results, researchers discovered there was no link between dietary supplements and mortality. However, they did find adequate intakes of vitamins A and K, magnesium, zinc and copper could lower the risk of death and diseases like cardiovascular disease and cancer. But this was only the case when the nutrients came from food, not supplements. Furthermore, researchers said taking 1,000 or more milligrams of calcium a day was linked with an increased risk of death from cancer. Also, those who took vitamin D supplements, but had no vitamin D deficiency, may have a higher risk of death from all causes. The authors did note some limitations. They acknowledged they collected data on supplements used only during the previous 30 days. They also said the dosage of supplements used was self-reported. However, they said they believed their findings are strong and hope to continue their investigations.